Ain't That Sherific? 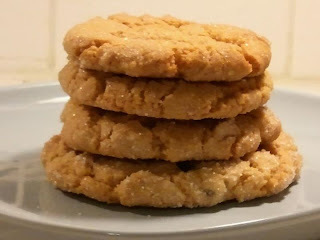 : No Flour Peanut Butter Cookies. . .
No Flour Peanut Butter Cookies. . . I made these for my mommy tonight. She has been gluten free for some time as they found out she has Celiacs Disease. She feels so much better than she ever has. She doesn't really crave baked goods, but every now nad again she pines for cookies and cakes. I know you can bake with gluten free flours, but they are far too complicated for me. I thought I would give these a shot. Totally gluten free peanut butter cookies. Bake for 10 minutes at 375 degrees on a cookie sheet lined with parchment paper. Remove cookies from oven but leave on cookie sheet to cool. I sometimes add other goodies like nuts, raisins, or trail mix and it is great. I never thought about using brown sugar before and think I will try it as I like to avoid using white sugar.